After two decades in the business, Chelsea Lindner is finished with art supplies — selling them, anyway. Lindner, 52, is the owner of Artists' Mediums in Williston. For 20 years, she's been an independent local retailer of art supplies — oils, canvases, pencils, sketchpads, pastels — to Vermont's professional artists and amateur dabblers. Much of that time she's spent answering customers' questions: What's the best paper to print on? Which soy-based inks won't run? How do I blend acrylics effectively? Invariably, Lindner has happily provided advice free of charge, even when customers left the store without spending a dime. But next month, Lindner will close her Williston store to focus on her newest venture: selling the works of Vermont artists, including herself, from her new store, Artists' Mediums Art Shop in Cambridge, which opened in April. It's not that she doesn't enjoy her work anymore, Lindner emphasized; online and big-box retailers have simply made it impossible for her to compete. As she put it, "I don't want my life to be about buying something for a dollar and marking it up to two." A Denver, Colo., native, Lindner has always worked on the borders of the art world. In high school, she operated a lead letterpress and printed signs for Denver-area shopping malls. 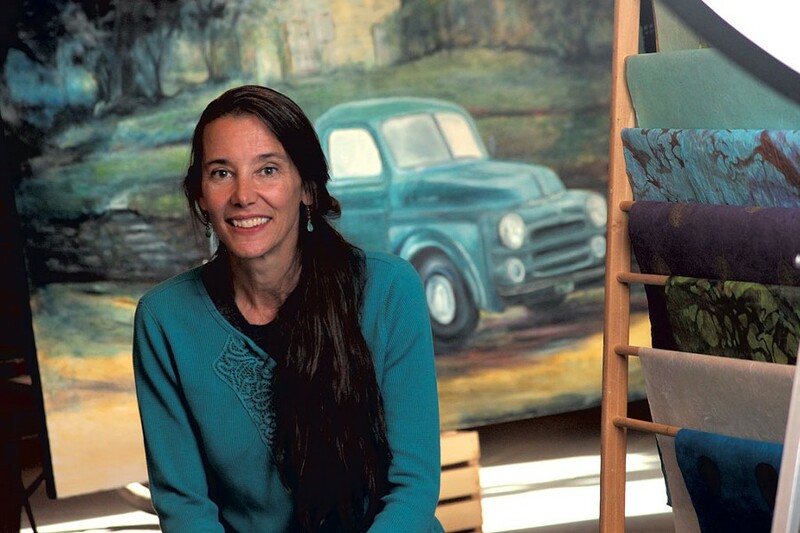 For a time, she painted cartoon cells for a Colorado animator. Then she worked in a fabric store while moonlighting as a seamstress for Renaissance festivals. She even made her own wedding dress, which took her four months. Last week, Lindner sat down in her Williston store with Seven Days. Despite it being a bittersweet time for her and her customers, Lindner sounded upbeat about the future, laughing easily and often. "Art is just like meditation. It's something you need. It's good for your soul. It gets you out of your head and makes you stop worrying," she said. "And, just like my friend who teaches meditation says, 'If you don't have time for 10 minutes of it a day, you probably need half an hour.'" SEVEN DAYS: What's your earliest art memory? CHELSEA LINDNER: Gosh, I must have been 5 or 6. We were living in Austin, Texas. Somebody gave me a toy camera that didn't do anything. It was just a box of plastic you could open in back. I decided I would "process and develop" my own film. So I would look at the yard, have my mom stand there, then draw a picture and cover it with Elmer's glue, because I wanted it to be a glossy photograph. SD: Did you ever want to be a full-time artist? CL: That's what I always wanted. Always! Whenever I said that, my father said to me, "So what are you going to do for a living?" Then, when it came time for college, I believed that if you went to art school, what they're going to teach you is how to draw 50 versions of a spaghetti package. They're going to teach me graphic art, not classic art, which is what I was really interested in. What I know now is, I could have gone to a traditional art school, but I didn't want to waste my father's money. He had four kids, and I was the last. SD: So, no formal art training? CL: Not really. But I started reading very young, and my mom had a lot of college-level drawing books that were available to me. Everywhere I lived, I tried to make a living as close to art as I could. When I moved to Seattle with my new husband, I literally took out the phone book and started calling any place that had anything to do with art. So I went into framing, then ended up selling paper supplies. CL: Then I learned about printing techniques from the people I was selling paper to. If you're going out to Vashon Island [in Washington], you're not going to spend five minutes visiting these people. You just took a two-hour ferry! You want to hang out and learn something. And my customers have always taught me an enormous amount about art and how to apply materials because they ask me questions I didn't ever think to ask. CL: I get to work with artists and creative people all day, every day. I get to see new art all the time and get inspired. I would never know as much as I do about art supplies unless people continued to ask me about it. I think the advice part is one of my favorite parts. They inspire you and challenge you to learn more. SD: What's your favorite medium? CL: I work mostly with monoprints and oils for the things that I sell. But I really do like sculpture. The problem with sculpture is, I want to work big and, if it comes out ugly, I'm stuck with it. So I do 25-foot snow sculptures in winter, but only if it's warm enough out, which is, like, three days a year. SD: How have your customers reacted to you closing this store? CL: Oh, my goodness. I had this one lady who was so sad and depressed. She said, "I can't imagine not being able to come here and get information from you." But [I told her] everything about this move is positive. You can still pick my brain up there [in Cambridge]. And maybe I can sell your artwork, too! The original print version of this article was headlined "Mediums Well Done"